Staples' Farrell Levenson, playing number three singles, keeps her eye on the ball during the tennis match against Fairfield Warde on Monday, Apr. 19, 2010. 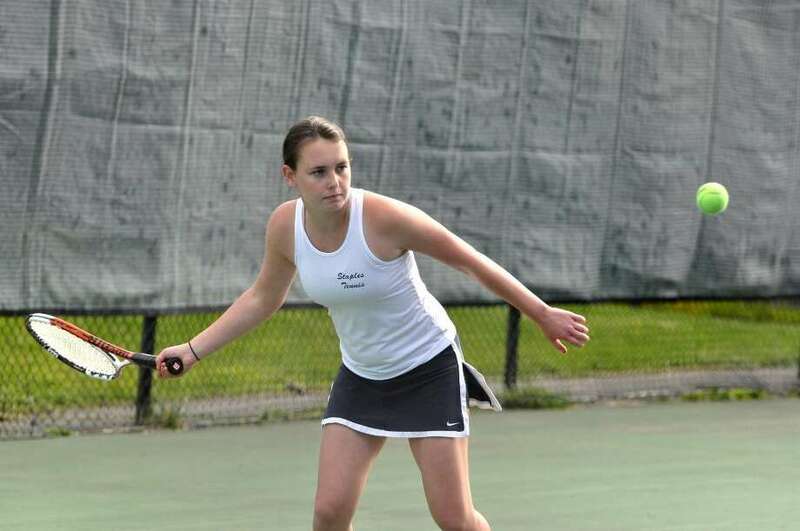 A sweep at singles catapulted the Staples girls tennis team to a 5-2 victory at Cheshire on Thursday. Staples raised its record to 8-1 and the Cheshire Lady Rams dropped to a deceiving 4-4. Cheshire is a perennial Class L semifinalist or finalist and has since raised its record to 6-4. "I was thrilled to have swept the singles matches," Lady Wreckers Coach Casey DeVita said. "Against a solid Cheshire team, that was a must. As it turned out, our top two doubles struggled and the four singles wins took the pressure off of our third doubles team." Three victories in straight sets was a pleasant sign for Staples. Sophomore Katie Reiner bageled Olivia Amato, 6-0, 6-0 at first singles, junior captain Farrel Levenson turned back Erica Larson at third singles, 6-4, 6-1, and junior Molly Rudinger dominated Alex Hirt at fourth singles, 6-1, 6-0, just falling short of a bagel. At second singles, sophomore Leigh Rubin bounced back from a first-set loss in a 5-7, 6-4, 6-1 victory over Katie Seggerman. "It was definitely a morale-booster," Levenson said. "We put in our best effort and we played well. It was definitely extremely windy, which made things complicated, but we were able to overcome this obstacle." In doubles, the Lady Wreckers lost two, three-setters after winning the first set in both matches. Cheshire's Hillary Dulton and Alyssa Carofano defeated Staples senior captain lefty Molly Laux and junior Hannah Bjornson at first doubles, 4-6, 6-4, 6-4, and Jamie Erickson and Maggie Tooley edged Lady Wrecker junior Alex Walsh and sophomore Nicole Marcante at second doubles, 1-6, 7-6 (7-5), 6-4. At third doubles, Staples came back after losing the first set and because darkness was approaching, the teams played a tiebreaker to determine the third set. Sophomore lefty Margaux Stamm and classmate Kate Collins defeated Theresa Fitzpatrick and Taylor Stronge, 6-7 (7-9), 6-4, 1-0 (7-5). "It was exciting beating Cheshire," Laux said. "Our girls played well and our two losses were three-setters, which were hard-fought matches." The Lady Wreckers hope their win over the Lady Rams will prepare them for two upcoming tough matches, today at Darien and next Tuesday at New Canaan. "Beating Cheshire gives us a boost going into our big matches against Darien and New Canaan and it gives us more confidence," Laux said. Levenson said, "We're definitely excited. We're a close team working together and we're excited for the coming weeks."